This week in the war, on 2 January 1942, French resistance leader Jean Moulin parachuted back into France. He had been in London and was sent back to France by de Gaulle to organize and unite the various resistance movements. Moulin had been France’s youngest prefect (préfet) but had been dismissed by Vichy in November 1940 when it became obvious that his sympathies were neither with Vichy nor with the forces of occupation. He supported resistance and learned all he could about current anti-German activities. He eventually found his way via Portugal to England, where he so impressed de Gaulle that the general sent him back to France as his official delegate. Resistance groups were desperate for arms and money. Since the British could provide both, many French resistance leaders were ready to heed Moulin and take their orders from de Gaulle. During this time, Moulin travelled throughout the south. He opened an art gallery in Nice to provide a valid reason for his trips. (He was an accomplished amateur artist and some his drawing had been published). In 1943, Jean Moulin was captured by the Gestapo and brutally tortured by Klaus Barbie, the infamous ‘Butcher of Lyon’. Moulin was murdered a short time later. 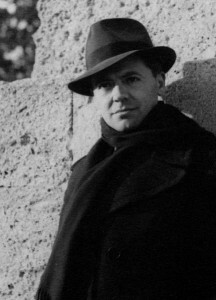 Jean Moulin became an iconic figure in postwar years. France wanted heroes and needed an interpretation of the ‘Dark Years’ of occupation that placed the blame for all of the horror solely on the shoulders of the Nazi occupiers (plus a few French traitors). 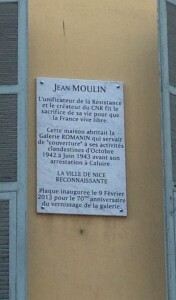 The tomb of Jean Moulin can be seen in Paris at the Pantheon, among others of France’s honoured dead. This entry was posted in World War II and tagged de Gaulle, Jean Moulin, Klaus Barbie. Bookmark the permalink.